One of the fastest growing names in chocolate sector has achieved 5% increase in sales and 80% reduction in sales promotion costs by using the meltag® for all loyalty solutions. 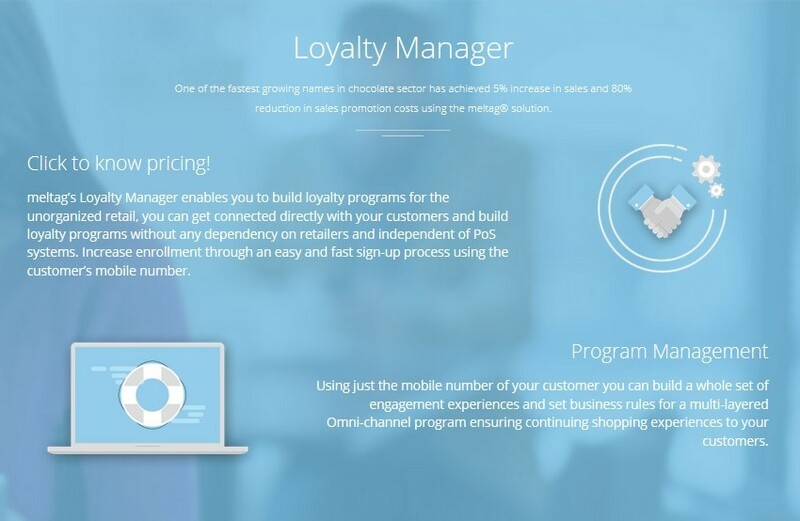 meltag’s Loyalty Program enables you to build loyalty programs in India for the unorganized retailers, and for all types of brand owner to connect directly with your customers and build loyalty programs without any dependency on retailers and which is also independent of PoS systems. Increase enrollment through an easy and fast sign-up process by just using customer’s mobile number. Using just the mobile number of your customer you can build a whole set of engagement experiences and set business rules for a multi-layered Omni-channel program ensuring continuing shopping experiences to your customers.